Ring forceps (also called hemostatic forceps) are hinged and look like ring scissors. Frequently, hemostatic forceps have a locking mechanism called a ratchet, which is used for clamping. The jaws of the locking forceps gradually come together as each increment of the ratchet is employed. Ring forceps are used for grasping, holding firmly or exerting traction upon objects. For especially delicate operations, generally ring handles with a locking ratchet are preferred over thumb forceps. 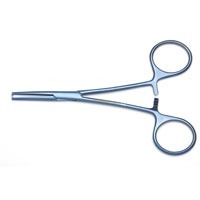 Locking hemostatic forceps may be called clamps and are used to securely hold tissue. When they are used to control blood flow, they are called hemostats. Hemostats are typically used to compress blood vessels or other tubular structures to obstruct the flow of blood or fluids. The jaws can be straight, curved or right angle. They come in a variety of sizes depending on your application. For example, Mosquito hemostats clamp small blood vessels, and Kelly hemostats can be used to clamp larger vessels or grasp tissue. Kelly hemostats and Rochester forceps look similar. However, Kelly hemostats have shorter serrations. Rochester hemostats can reach a little deeper.